Dolce & Gabbana’s exquisite sartorial menswear footwear is crafted in Italy from the finest leathers with attention to detail rendering each design unique. 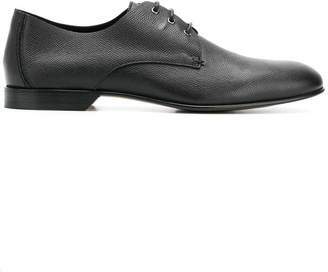 These smart, patent leather varnished Derby shoes from the design duo’s Napoli range, are a seasonal staple. In midnight blue, these Derbies feature an almond toe, a lace-up front fastening, a brand embossed insole and a stacked sole and have undergone a Blake processing - this artisan process involves the insole, tongue and sole sown simultaneously for a streamlined finish.